My paper with Lukasz Rachel on secular stagnation and fiscal policy summarized here has attracted a number of interesting responses including from Martin Wolf, David Leonhardt, Martin Sandbu and Brad DeLong and also many participants at the Brookings conference. I’m gratified that there seems to be general acceptance of the core secular stagnation argument. “Normal” policy settings of real interest rates in the 2 percent range, balanced primary budgets and stable financial markets are a prescription for stagnation and underemployment. Such economic success as the industrial world has enjoyed in recent decades has reflected a combination of very low real rates, big budget deficits, private leveraging up and asset bubbles. No one from whom I have heard doubts the key conclusion that a combination of meaningfully positive real interest rates and balanced budgets would likely be a prescription for sustained recession if not depression in the industrial world. Notice that this is a much more fundamental argument than the suggestion that the some effective lower bound on interest rates may impede stabilizing the economy. The argument is that because of chronic private sector tendency towards oversaving, economies may be prone to underemployment and financial stability absent policy responses which are themselves problematic. This is an argument much more in the spirit of Keynes, the early Keynesians, and today’s Post-Keynesians than the New Keynesians who have set the terms for much of contemporary macroeconomic discourse both in academia and in the world’s central banks. The central feature of New Keynesian models is an idea that economies have an equilibrium to which they naturally revert independent of policies pursued. Good central bank policy achieves a desired inflation target (assumed to be feasible) while minimizing the amplitude of fluctuations around that equilibrium. In contrast contemporary experience, where inflation has been below target almost throughout the industrial world for a decade and is expected by markets to remain below target for decades, and where output is sustained only by large budget deficits or extraordinary monetary policies, suggest that central banks acting alone cannot necessarily attain inflation targets and that misguided policy could easily not just raise the volatility of output but also reduce its average level. While there seems to be little doubt that real interest rates–short and long, ex ante and ex post — have declined very substantially even as (other things equal) budget deficits and expanded social security programs should have increased them, there remains debate about how to analyze these trends. Lukasz and I argue that adjustment to balance saving and investment is the best way understand declining real rates. DeLong wonders about changing risk premiums and Wolf cites BIS work arguing that low rates reflect the monetary policy regime. 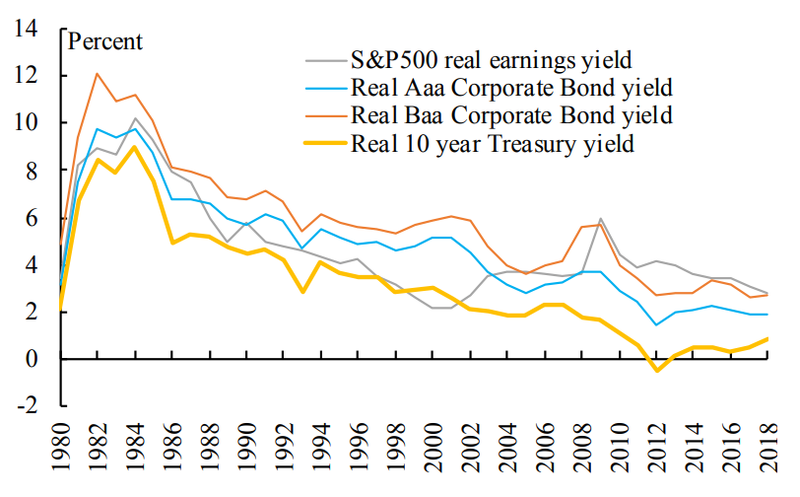 There is no reason why there needs to be only one cause of low real rates so these factors may enter. But as I expect we will illustrate in the revised version of the paper, the largest part of the low frequency variation in ex ante real returns is accounted for by a downward trending factor common to all asset prices. This is illustrated for the US in the figure below. So risk premiums or factors specific to Treasuries are likely not high order. Granting that secular stagnation is a problem, there is the question of policy response. The right policy response will be the one that assures that full employment is maintained with a minimum of collateral problems. Sandbu argues against the notion of secular stagnation in part because he thinks it may lead in unconstructive directions like protectionism and because he believes that stagnation issues can be feasibly and relatively easily addressed by lowering rates. Wolf, relying on the BIS, is alarmed by the toxic effects of very low rates on financial stability in the short run and economic performance in the long run, and prefers fiscal stimulus. Leonhardt prefers a broad menu of measures to absorb saving and promote investment. I am not certain of the right approach and I wish there was more evidence to bring to bear on the question. I can certain see the logic of the “zero is just another number” view, that holds that the current environment poses no new fundamental issues but just may require technical changes to make more negative interest rates possible. I am skeptical because (i) I am not sure how large the stimulus effect of rates going more negative is because of damage to banks, reduced interest income for consumers, and because capital cost is already not the barrier to investment; (ii) I wonder about the quality of any investment that was not made at a zero rate but was made at a negative rate; and (iii) I suspect that a world of significantly negative nominal rates if sustained will be a world of leveraging, risk seeking and bubbles. I have trouble thinking about behavior in situations where people and firms are paid to borrow! I am inclined to prefer more reliance on reasonably managed fiscal policies as a response to secular stagnation: government borrowing at negative real rates and investing seems very attractive in a world where there are many projects with high social returns. Moreover, we are accustomed to thinking in terms of debt levels but it may be more appropriate to think in terms of sustained debt service levels. With near zero rates these are below average in most industrial countries. The content of fiscal policies is crucial. Measures which run up government debt without stimulating demand like large parts of the Trump tax cut are ill advised. In contrast measures which promote investment and raise the tax base down the road are much more attractive. There are of course other measures beyond stabilization policies like fighting monopolies, promoting a more equal income distribution, and strengthening retirement security for which the desire to maintain macroeconomic stability provides an additional rationale. Stiglitz echoes conservatives like John Taylor in suggesting that secular stagnation was a fatalistic doctrine invented to provide an excuse for poor economic performance during the Obama years. This is simply not right. The theory of secular stagnation, as advanced by Alvin Hansen and echoed by me, holds that, left to its own devices, the private economy may not find its way back to full employment following a sharp contraction, which makes public policy essential. I think this is what Stiglitz also believes, so I don’t understand his attacks. In all of my accounts of secular stagnation, I stressed that it was an argument not for any type of fatalism, but rather for policies to promote demand, especially through fiscal expansion. In 2012, Brad Delong and I argued that fiscal expansion would likely pay for itself. I also highlighted the role of rising inequality in increasing saving and the role of structural changes toward the demassification of the economy in reducing demand. Despite the incoming president’s popularity and an all-out political effort, the Recovery Act passed in Congress by the thinnest of margins, with doubts about its ultimate passage linger until the last moment. I cannot see the basis for the argument that a substantially larger fiscal stimulus was feasible. And the effort to seek a much larger one certainly would have meant more delay at a time when the economy was collapsing – and could have led to the defeat of fiscal expansion. While I wish the political climate had been different, I think Obama made the right choices in approaching fiscal stimulus. It is of course also regrettable that after the initial Recovery Act, Congress refused to support a variety of Obama’s proposals for infrastructure and targeted tax credits. What about the Clinton administration record on financial regulation? With hindsight, it clearly would have been better if we had foreseen the need for legislation like the 2010 Dodd-Frank reforms and had a way to enact it with a Republican-controlled Congress. Certainly we did not foresee the financial crisis that came eight years after we left office. Nor did we anticipate the ways in which credit default swaps would mushroom after 2000. We did, however, advocate for GSE reform and for measures to rein in predatory lending, which, if enacted by Congress, would have done much to forestall the accumulation of risks before 2008. I have not seen a convincing causal argument linking the repeal of the Glass-Steagall Act and the financial crisis. The observation that most of the institutions involved – Bear Stearns, Lehman Brothers, Fannie Mae, the GSE Freddie Mac, AIG, WaMu, and Wachovia – were not covered by Glass-Steagall calls into question its centrality. Yes, Citi and Bank of America were centrally involved, but the activities that generated major losses were fully permissible under Glass-Steagall. And, in important respects, the repeal of Glass-Steagall actually enabled the resolution of the crisis, by permitting the merger of Bear and Merrill Lynch and by allowing the US Federal Reserve to open its discount window for Morgan Stanley and Goldman when they otherwise could have been sources of systemic risk. I suggested on Friday when it became clear that the tax bill would pass that “thousands would die.” In light of my sharp criticisms of other economists claims regarding the tax bill, some have asked whether my statement is well grounded. I believe so, but this should be open to debate. In response to the Carrier caper after the election last year, I decried the Trump administration’s preference for what I called ad hoc deal capitalism. I noted that the practice was characteristic of developing countries and earlier times in the United States and that it was much less conducive to prosperity and freedom than capitalism based on the predictable rule of law. Until last month, there had been fewer cases of deal capitalism than I had feared. But in the last month, policy has taken an ugly turn toward the selective and ad hoc use of government power — not to reward political friends but to punish political adversaries. Government rewards encourage cronyism and rent-seeking and waste public resources. Targeting adversaries may chill dissent and threaten democracy.